steveninspokane wrote: All these familiar names, it doesn't even feel like I am on a different forum. Except for my lack of a post count. unemployed2long/1208 wrote: don't understand!1 Is 589 dead now??? OR what is going on with it! 1208 was this your old avatar on U-F? Of the 300 I have had, Grandpa was one for a long time! C-Span- House still talking about amendments. stilllooking wrote: C-Span- House still talking about amendments. I'm sorry but I just can't handle seeing Congress "in action." If you want to call that action. But yeah, I just can't watch them either, I think it was Bernie Sanders 11 hour run down on social security that ruined it for me. kemcha wrote: Thanks, mrgolf. While my posts at the old site may have been a little negative, I promise you guys that my contribution here will be a bit on the positive side here. I'm looking forward to contributing to the new site, provided my time can be appropriately divided between managing my own website and community as well as my contributions to the Huffington Post community. Heh, Heh!!! Thanks. I'll be around, sporadically. While I have my own website that I manage for the anime and manga online community, I've decided to start an unemployment advocacy community that will work with you guys here in helping everyone get more information regarding unemployment extensions in Congress. if this bill is alive......where is it? everyday that goes by, i can not understand this country....how we all can be out of work is beyond me. Don't know if there's any movement with congress out this week. Maybe the W&MC is working diligently behind the screen with Oz. I checked on HR589 on congress.org. It's in the 'hot bills' category but I don't know what it takes to get there. Someone else might know more about that than I do. I am feeling the same today also. The thing that bothers me is that the media doesnt even know we exist, and all the white house keeps saying is how great the economy is doing. How do we make our voices heard??? I think they know all about us. They just choose to ignore us. You just have to keep getting your story out there. Send your story to your local media. Call talk radio. 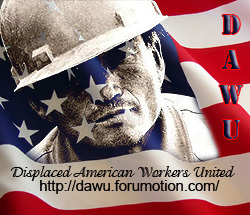 Send pdsnickels (co-founder of UWAG & American 99ers Union) your story. laramel wrote: I think they know all about us. They just choose to ignore us. In every email and fax I send I remind them that we are watching closely and that we will remember who helps move HR589 forward and who hinders it. Then I point out that we still have our vote and voices to speak out ,though very little else. No question they know who we are just we are not a threat to them, so you are correct, they ignore us. Easier to do that than try to pass an unpopular bill right now. No easy answer but we should keep fighting nonetheless! The republicans want to crush the poor and middle class, I don't think H.R. 589 has a chance. Republicans see the unemployed, 99ers, as a wad of gum under their shoes. They want to ignore us but they can't get rid of us. We will be growing in the numbers as time goes by. Without monetary and strong leaders to stand up for us, we are doomed. js123 wrote: The republicans want to crush the poor and middle class, I don't think H.R. 589 has a chance. Republicans see the unemployed, 99ers, as a wad of gum under their shoes. They want to ignore us but they can't get rid of us. We will be growing in the numbers as time goes by. Without monetary and strong leaders to stand up for us, we are doomed. Perfect, the gum campaign, enough tossed out and keeps sticking on their shoes, they will want to get rid of the problem. I like it! kemcha wrote: I think the problem everyone is facing is that while the bill is in committee that it may be nearly impossible to get it out of committee because the Republican in charge of the committee is said to be against any and all unemployment extensions. In his own words.....the Chairman of the House Ways & Means Committee Rep. Dave Camp has expressed full support for federal unemployment benefits so long as they are paid for. I am puzzled by this statement on the part of Rep. Camp: " I urge my colleagues to oppose this deficit extending bill today, so we can bring up a real bill that allows us to pass and actually pay for these benefits for the long-term unemployed." What stopped him and the rest of the Republican Representatives from bringing up their own paid-for bill for exhaustees? The Republicans are now are in the clear majority. Their bill could have been out of Committee and passed in a day I would think. Yes. Id' like to see a "real bill", one that ties extensions to the unemployment rate. A 14 week extension is barely "real", although better than nothing for people on the verge of ruin. Something doesn't add up. Rep. Camp's excuse might have sounded sincere when he was in the minority, but I think he's forgetting that he and his fellow Republicans are now running the House. Am I wrong? Where is THEIR bill? Of course, he had no problem approving the budget-busting tax extensions. Why weren't they offset if he is so concerned with the deficit?